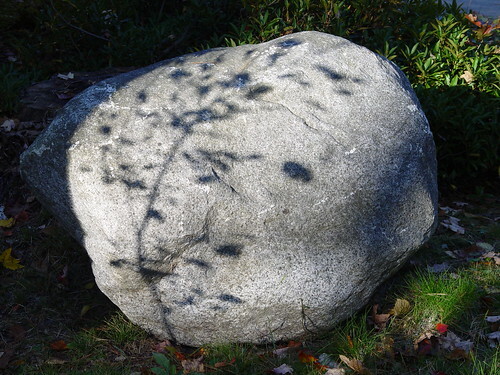 a boulder with shadows…it reminded me of one of Bilbo’s trolls! hmm…i was gonna say it was eggs in a bowl, but looking at it again, i am seeing plum wine. or maybe i just really want a drink…that’s probably it. Cells dividing in a petri dish. I’m going to pick apricots for the fruit looking things but I have no idea what they are in–this is a tough one. Two egg yolks in a glass bowl? At first I thought it was those jellied bath beads (the kind that dissolve and leave a scented bath and oily scum tub ring) …but then it also looked like apricots… and then I thought it looked like there was a hand surrounding whatever it is! And then I wondered why anyone was preserving apricots in a glass… and now I can’t guess anymore. I was going to go with eggs, then my mind went to polyps in a colon and I can’t seem to get it to leave! Bumbles answer is the best. I think maybe my monitor is not right because to me it looks like the top of roasted marshmallows. Ooooh, love your yahoo avatar. Mickey Mouse coming feet-first down a tunnel slide! Two olives in the bottom of a martini glass! Making me thirsty! Apricots in a punch bowl? I’m thinking of peaches or bread rolls and the shot is taken through something with water in it? That’s your lower GI tract, getting healthy. See that nice clean color? That’s what health looks like. 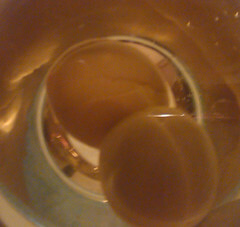 Two egg yolks in a glass bowl that is sitting on a wooden table. I think it’s eggs in a silver bowl – a bowl that I have the same one! I had another thought, a Lava lamp!! Do you get to guess twice? LOL! I know everyone already said it, but I am going egg yolks. 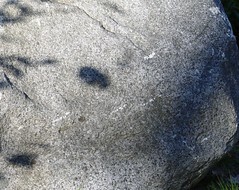 But just as an excuse to comment, because I really just wanted to stop and say Hi! And see how things were going. Hmmm… I’m guessing apricots in syrup. a close-up of two lonely chickpeas in a bowl of water?